SLTA president John Shearer has called on the licensed trade to continue to take the lead on all issues affecting the industry. 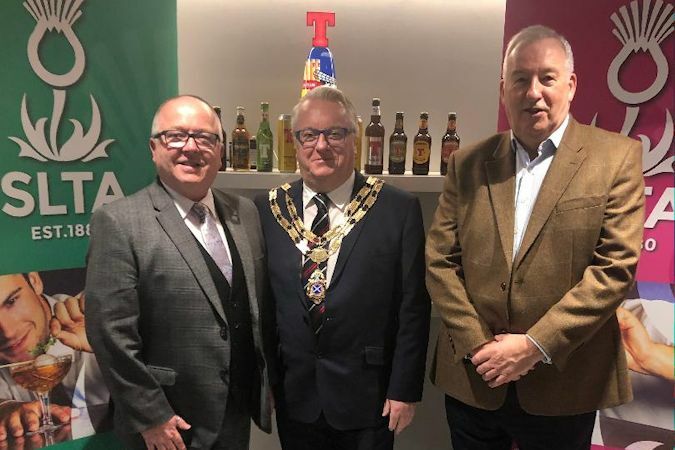 The Highlands hotelier, speaking at the trade association’s well-attended AGM in Glasgow, described the last year as “exciting” and one which had seen a reorganisation of the SLTA, the creation of a new non-executive board of directors, a new regional council and, in the form of Colin Wilkinson, a new managing director. “Politicians and government don’t run the industry – we do, so let’s take the lead,” he said, pointing out that “we will continue to work with government and are represented at both ministerial and cross-party group discussions”. Mr Shearer said: “We are also working closely with other organisations including bartenders, mixologists, Scottish Tourist Alliance, British Soft Drinks Association, HIT UK, Hospitality UK and The Ben. Looking ahead, the president said that the SLTA would look to increase its level of registered supporters, incorporating personal licence holders, while maintaining registered stakeholders as the “backbone of the association”. Mr Shearer also paid tribute to the increased corporate support from the SLTA’s sponsors and thanked them for their much-valued contribution to the health and success of the association. He also singled out SLTA chairman Jim Grierson and the non-executive board as an “inspiration”. The meeting took place at the excellent new Tennent’s Story Experience at Wellpark in Glasgow.